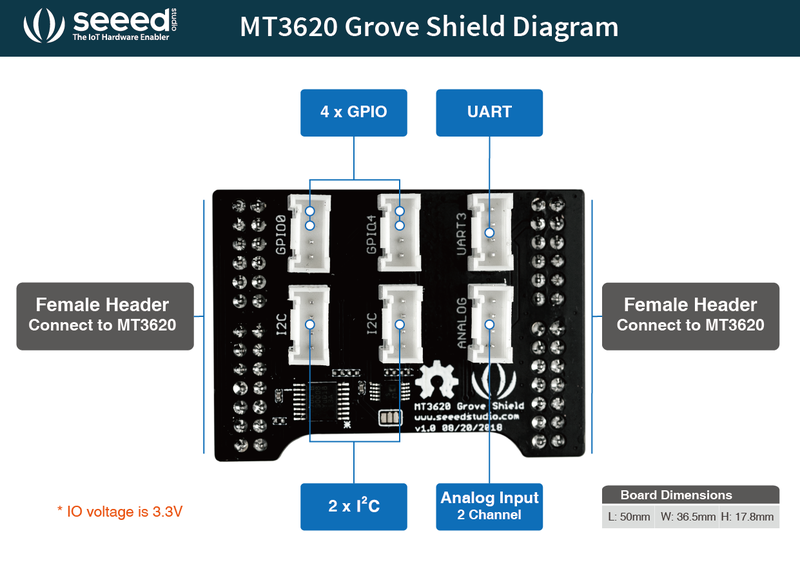 How to use the MT3620 Grove Shield and the Library for the Grove modules. How do I send data to the display using the shield for the MT3620? Hi Dave, please refer to the demo. **http://wiki.seeedstudio.com/Azure_Sphere_MT3620_Development_Kit/#azure-sphere-demo** thanks. For future versions of this shield, please, please, please, extend the header pins from the MT3620 through the top of the shield. Hi there, thanks for the inputs, we already feedback to product manager. thanks. I just discovered that power to the Grove devices from this shield is 3.3v. That doesn't appear to be enough power to drive the Grove-LCD RGB Backlight device that I have. Is there a way in software to switch the power to 5v? HI there, please use **https://www.seeedstudio.com/Grove-16-x-2-LCD-(Black-on-Yellow)-p-3198.html**. it supports 3.3v. thanks.